I am such a big fan of Sarah Alderson's, I really am. I think I'll always be incredibly excited to read a book by her. So when I saw Conspiracy Girl was on Netgalley, I jumped at the chance to read it. And while there were a few glitches to the actual text, I persevered with it because every book by Sarah Alderson has this amazing combination of being really exciting and fast-paced and romantic. 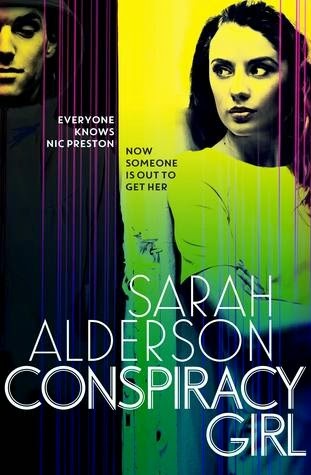 And Conspiracy Girl had my heart racing both because it's quite thrilling but also the chemistry between the two main characters. Conspiracy Girl is a dual-perspective novel told both from the point of view of Nic and Finn. Nic Preston is an 18 year old college student who is trying so hard to rebuild her life after a brutal home invasion several years ago meant that she was the only survivor. Both her mother and step-sister died and Nic has been quite understandably shaken up by the events and it's left her paranoid and safety-conscious. Especially because the two people who killed Nic's family were caught but then walked free. And then there's Finn, a super-smart hacker and the person responsible for the killers to walk free. When Nic's apartment building is broken into, and her security is compromised it's up to Finn to keep Nic safe and to delve into her case again and find out who is responsible. As I said, I absolutely flew through the pages of this story. I think Sarah Alderson has an incredible for writing really exciting and addictive stories. I couldn't pull myself away from these characters and this story. I quite liked the twisty-turny plot and all of the dangerous situations Nic and Finn get into. I thought Nic's paranoia and grief was portrayed very well and I loved seeing her vulnerability throughout and also seeing how much more confident she becomes throughout this story as her and Finn go on the offensive towards finding the people responsible for her family's deaths and this current attack. I did kind of want to see Nic saving herself and relying less on Finn, but I also got that Nic needed to progress more to get to that. My only real criticism of this book is a surprising one to me. For me, while the love story is usually my favourite aspects of a Sarah Alderson story, I felt like at times, it didn't feel quite right for there to be this burgeoning relationship between Finn and Nic. I get that there's is a complicated relationship with all the baggage they both carry, but I actually didn't want the romantic build-up and chemistry to be occurring at the same time as some of the thrilling aspects of the story. I really liked both characters and I loved that it felt like it was a bit of an obstacle for them to be together and while I did love how hot they were together, I just wanted more distance between the steamy kissing and the chase scenes in which bullets are flying. All in all, I think Conspiracy Girl was an ace read - highly addictive and emotionally charged with great characters and relationships. Plus, bonus points for including an adorable dog! I loved this too. I actually thought that Nic's gradual ability to save herself as the book progressed was a strength. She grew and changed and came into her own with her adventures and Finn by her side. Yeah, like I said, I thought seeing her grow in confidence was a good thing it just felt like too much initially. It sounds really good! I haven't read anything by her in a while, but I have really enjoyed the books I have managed to read. This one was a definite page-turner!